The Gasifier and Biochar Workshop is a 2 day event where we will build a charcoal gasifier and a charcoal kiln as a practical solution to power an engine – with wood. 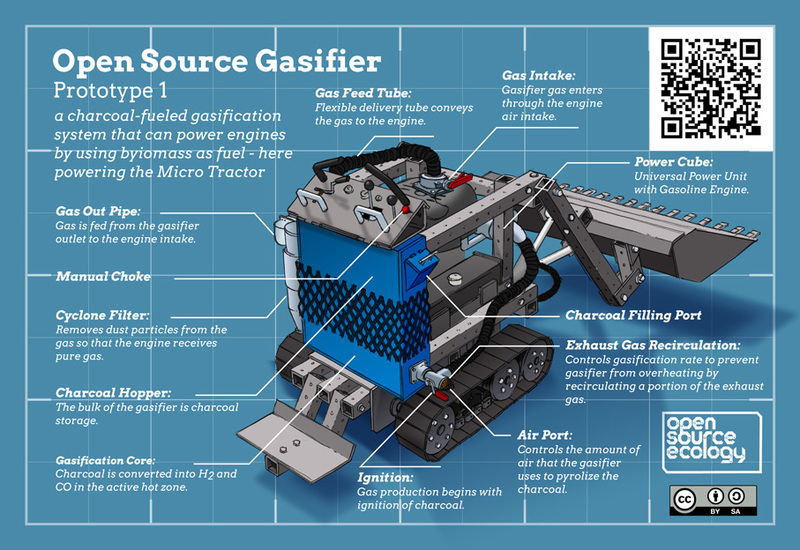 This workshop follows immediately after the open source MicroTractor Workshop, and we will add the gasifier as a compact unit onto the 27 horsepower MicroTractor. The goal of this workshop is to do a rapid, immersive build. Participants will participate in and experience a build of a practical gasifier system to replace gasoline fuel in standard engines. The gasifier runs on locally produced charcoal. To this end, we will break into two parallel teams during this workshop, where we produce both the gasifier – and a charcoal-producing kiln. These are both well-proven DIY technologies. The intent is to demonstrate the practicality of a renewable and CARBON NEGATIVE energy system. Open Source Ecology will be using one half of the charcoal that it produces as biochar to fertilize the soil by providing for the growth of the soil food web – and use the other half to power its agricultural machines. This is part of demonstrating a local fuel ecology, where future developments of the charcoal-based system can be used for fueling machines, generating electricity, heating water, cooking, combined heat and power, and rebuilding of soil. We will show how this can be done by using coppiced and pollarded renewable perennial crops such as willow, mulberry, and hazel wood – while increasing the biodiversity and rebuilding the soil. Workshop immersion involves concept and practice, and includes crash courses on key elements of fabrication, OSE’s modular design methods, CAD, and documentation. Participants become part of OSE’s design and build process, where we produce open source blueprints for the infrastructures of civilization. This workshop focuses on one of the 50 machines of the Global Village Construction Set – the gasifier burner. The first day includes crash courses in welding, torching, and other tool use. The workshop features use of OSE’s open source production machines – including the open source 20-ton hole puncher, ironworker machine, and CNC Torch Table. This workshop is intended for people interested in immersion, hands-on skills training and practical results. This immersion course may be especially useful to people who would like to master their own machines and tools, such that the machines can last a lifetime. We are inviting those individuals who are interested in building their own gasifier and charcoal maker – or entrepreneurs interested in starting a business producing charcoal or gasifier-powered MicroTractors. OSE’s goal is to create open, collaborative, ethical enterprise ecosystems. We are particularly interested in developing open Working Teams and Open Source Consortia for bringing regenerative enterprise into the marketplace. We are also inviting dedicated documenters and videographers to participate in documentation. The overall workshop is designed for people interested in transitioning from Zero to Maker, and we elco though those with experience will also learn a number of skills. Can’t weld? We’ll give you a crash course. This course assumes no prior skills outside of general body awareness. Some people will be given documentation tasks if appropriate. Weekend Workshop (July 16-17): Design, Build, and Get Skills. Documentation Track (July 16-17): Document for replicability. Dan Hartman is a programmer by day and creative builder by night at Dan’s Workshop. He has built a wide range of practical homebrew devices spanning mechanics and electronics – such as running his car on charcoal, a MIG welder gun, andCNC Router, to name a few. He is bringing his experience in gasification and wood heating to this workshop. 9:30AM: Introduction to the Gasifier and Charcoal Maker design and build process. Using FreeCAD for manipulating design, Documentation Procedures, Contributing to OSE Development. 11:30PM: Crash Courses in workshop + custom fabrication tools training. Welding, torching, grinding, drilling, CNC Torch Table. Making sample parts. Data collection. 2-5PM: Extreme Build: Breakout into work stations. Parts Inventory and Layout; Pre-cutting; Fabrication. 6:30-7:30PM: Quality Control Briefing and Continuing the build. 1PM-5PM: Build completion and first runs. 6:30-7:30: Discussion, Feedback, and Closing. Sponsor another participant: Sponsor $250 to fund attendance of someone who is on the waiting list for financial assistance. Charcoal production wastes at least 70% of the energy in wood. Better to gasify the wood and use the producer gas as engine fuel. you might be able to reutilize the waste heat for some other use, micro steam engine for instance, or supplementing a bread oven.